Globalization has been accelerating since the 1990s. Increased globalization has forced many companies in the supply chain industry to start to conduct business with distribution centres that are located near their business area in order to shorten the distance between manufacturers and customers, as well as to shorten lead-times and maintain tighter delivery windows. Thus, many companies have outsourced their logistics functions over the past 10 years, especially logistics function through a public distribution centre. Conducting business with a public distribution centre begins with signing a contract with the third party logistics providers. Thus, well defined processes and tools to determine optimal storage space have become indispensable techniques for their successful business. 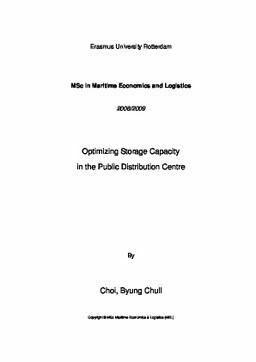 This thesis looks closely at how to decide the optimal contract storage space (ft²) for a firm in a public distribution centre while minimizing the total cost. The objective of this research is to provide the practitioners in the supply chain industry with a decision tool for determining optimal contract storage space. In this research, we develop a formula and two mathematical models. The formula is used to compute the required storage space as basic demand information. The mathematical models are used to determine the optimal contract storage space with and without based on some of the candidate scenarios provided. In order to solve the mathematical models, solution methodologies are suggested. One suggestion is to simplify the model with new constant and the second suggestion is to linearize the model. Thus the model can be solved easily by Excel Solver. Finally, we have derived a number of conclusions from the numerical examples; the first, solution time by the Excel Solver program is quite fast by virtue of the linear programming model. In 1 second, the optimal solution is found. The second, optimal solution is determined when total cost is minimized. Total cost is the sum of the cost using the public distribution centres and overflow warehouse. The third, suggested optimal solution is not to use the overflow warehouse unless demand severely fluctuates. The fourth, shorter contract period is better than a longer one as far as the contract logistics market allows. It suggests that the model in the monthly contract period is a more optimal solution, than a solution on a yearly contract basis.